The nearest potential impact date with the asteroid, dubbed Asteroid 2018 LF16, falls on August 8, 2023. The asteroid could then cross paths with the Earth’s orbit again on August 3, 2024, and August 1, 2025. In total, there are 62 dates on which the space rock could hit the Earth, although the risk of this cataclysm happening is pretty low. Based on NASA’s calculations there is a one in 30,000,000 chance of LF16 slamming into our home planet – a 99.9999967 percent chance of a miss. On the Torino Impact Hazard Scale the asteroid is a ‘Zero’ meaning the likelihood of impact is either nonexistent or as close to nonexistent as possible. But the sheer size and number of potential impact dates make the space rock and incredibly formidable object to track. At the moment, the asteroid is barreling through space at more than 33,844mph or 15.13km per second. NASA’s experts estimate the asteroid has a diameter of around 698.8ft (213m). A space rock this big is about twice as tall as Big Ben’s clock tower in London, twice the height of the Statue of Liberty in New York and is four times as tall as Nelson’s Column in Trafalgar Square. If that is not terrifying enough, the impact force of an object this big could be as big as the Tsar Bomba’s 50 Megaton blast – the most powerful nuclear device ever detonated on the surface of the planet. Thankfully, according to the European Space Agency (ESA), asteroids this large tend to strike the Earth less than once every 1,000 years. 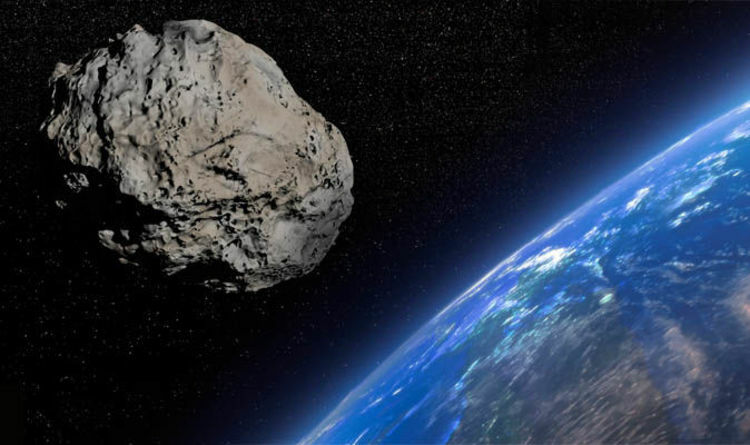 And it would require a significantly larger asteroid upwards of six-miles-wide (10km) to witness an extinction level event comparable to that of the dinosaur-killing asteroid 65 million years ago. The ESA said: “Some asteroids are very large, and would cause enormous destruction if any were to strike Earth, but their estimated population in our Solar System is rather small and more than 90 percent of these are thought to have been discovered. None of these pose any risk of impact. “Some are very small − below 10m diameter − and only a tiny fraction of the estimated population of these have been discovered, but any impact would be harmless. Many such asteroids exist out there in the void of space and the impact damage from one of these space rocks could cause significant damage to cities or populated areas. READ MORE: WATCH: Huge fireball lights up the skies above Russia – and NASA missed it! But with enough forewarning, the ESA said appropriate measures can be taken to protect the people. Asteroid LF16 was discovered by NASA's Jet Propulsion Laboratory’s (JPL) Sentry System – an automated asteroid monitoring system designed to track potential impact risks lurking in space. NASA said: “Sentry is a highly automated collision monitoring system that continually scans the most current asteroid catalogue for possibilities of future impact with Earth over the next 100 years.